These hands were the most loving that could be. In times of need, the touch of these hands brought comfort and peace. I feel the absence of these hands cause the good things in life do not last forever. These hands carried so much love that I have cause to believe that these hands will always be around to care for me. The magic touch of these hands filled my heart with joy and ensured that we were but one self, bonded to each other. When I was hungry, these hands methodically and lovingly prepared delicious foods that we would enjoy and share with others around the world. I have seen these hands comfort the down and out and give them reason to carry on with hope and trust in God. I have seen these hands bring me to reason when I lost my ways and started to wander. These hands tilled the soil, dug up the weeds and sowed the seeds that would bring the flowers to welcome the change in seasons. My efforts in home maintenance and other things would have amounted to nothing if these loving hands were not there to help me and give me courage to carry on. I always looked well cared for because these hands made sure that the clothes I wore were the very best. When we walked around, these hands proudly held on to mine, to publicly proclaim our undying love for each other. The touch of your hands was enough to symbolise the unconditional love that we had for each other. Words were not necessary as these hands spoke their own language of love. These hands endured the trauma of chemotherapy, never giving up and always on the ready for the next challenge. In the middle of the night, these same hands touched me and caressed me to sleep so that tomorrow was something worth waking up to. 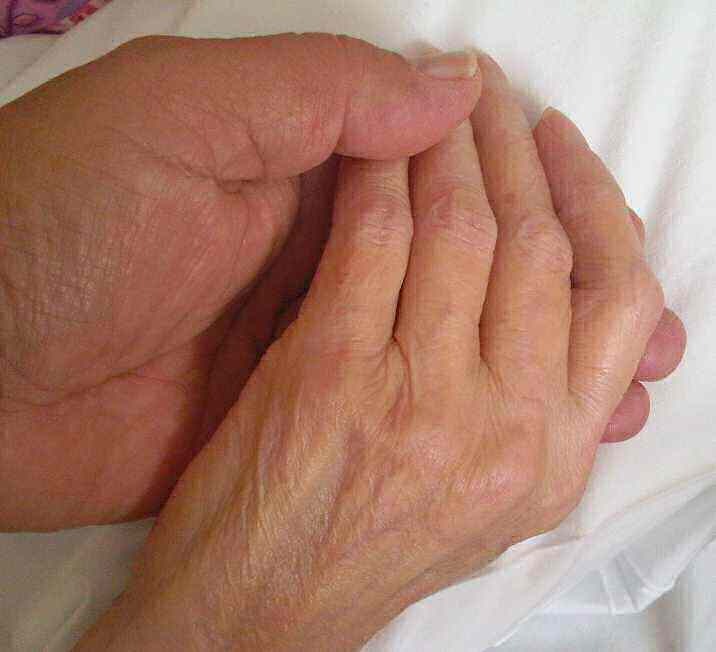 When I was hurting or felt not too good, these hands would be there offering comfort and solace in remedies that only loved ones can provide. You wore our wedding ring on these hands proudly displayed to show the world that we were bonded for life and in the thereafter. These hands held on to mine with so much love, in spite of the hard times you went through that I can still feel your loving touch to this day. The day the Lord took you into his care, these hands stayed with me. I have no doubt that these hands are still caring for me in more ways that I can imagine. Your unique left hand tug came to me to let me know that you were OK. These loving hands will always be with me cause they are very much part of me now. The touch of an angel that will always be part of my life, now and thereafter. All opinions and contents are given in good faith. Please consult your doctor for expert advice and further information. 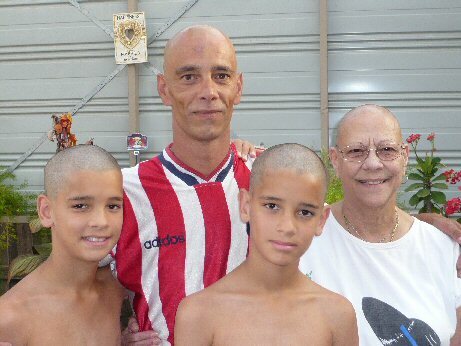 Gerard (Madeleine's son) & the grandsons Joshua & Brandon showing solidarity by shaving their heads too.